A broken wrist will cause pain, swelling, bruising, and difficulty moving the wrist. More severe fractures can result in a deformity of the arm, or tingling in the fingers. These injuries are typically seen in an emergency department or in an orthopaedist’s office, and a splint will be applied. If the fracture is displaced, meaning the bone it not well lined up, a “reduction” may be needed to set the bone. 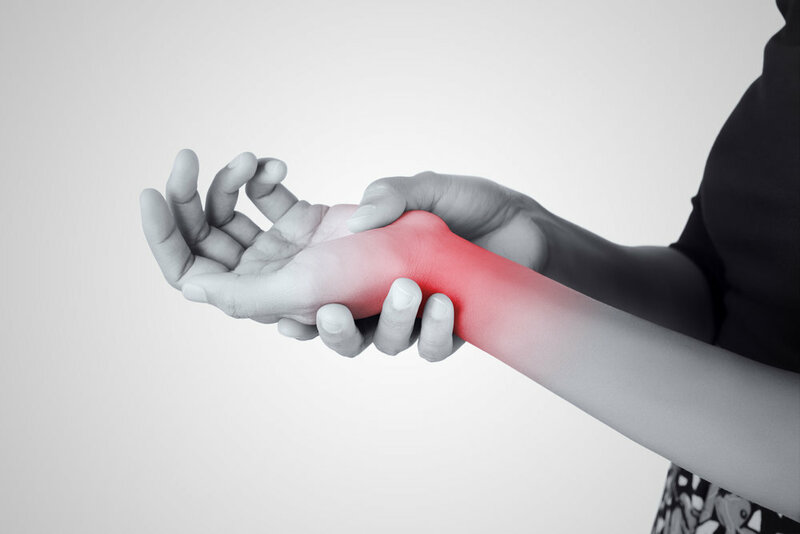 Typically, a local anesthetic (lidocaine) is injected near the fracture, and the hand and wrist are manipulated to improve the alignment of the wrist. A splint or cast is placed, and if x-rays show the bone is in an acceptable position, the fracture is allowed to heal. In general, a broken wrist takes about 6 weeks to heal. 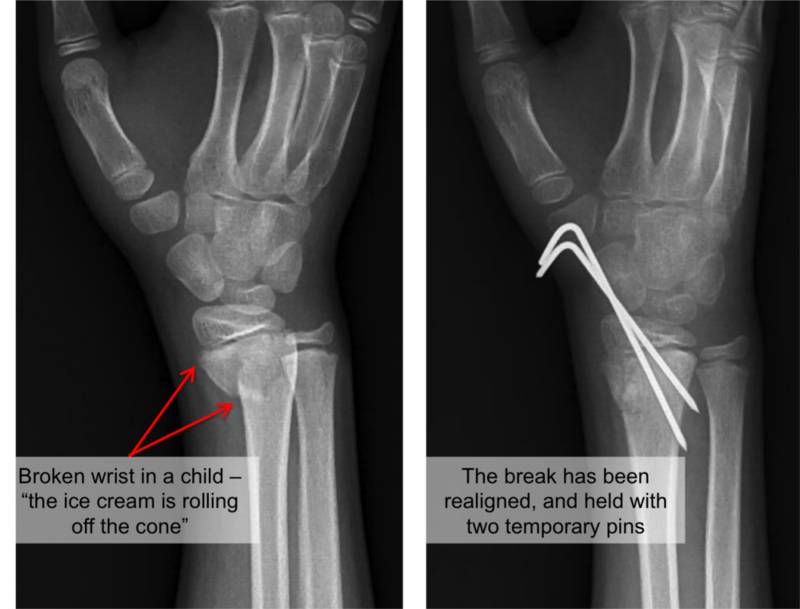 Once x-rays show that the break has mended itself, you can start using the wrist again. Sometimes therapy is helpful to improve strength and flexibility of the wrist. Sometimes, in more severe fractures, surgery may be recommended. A broken wrist with several pieces, a fracture that has severely shifted, or a break resulting in an uneven joint surface, can all cause problems. More severe fractures can result in pain, decreased ability to bend the wrist, and can lead to arthritis if allowed to heal in a suboptimal position. Surgery can improve the alignment of the bone to minimize these risks. The surgery needed depends on the age of the patient and the fracture. Some simple fractures, or fractures in kids, can be treated with temporary pins without making an incision. The bone is lined up with the assistance of a small x-ray machine in an operating room, and pins are placed through the skin to hold the bone in place. These pins are typically removed in the office several weeks later once healing is underway. 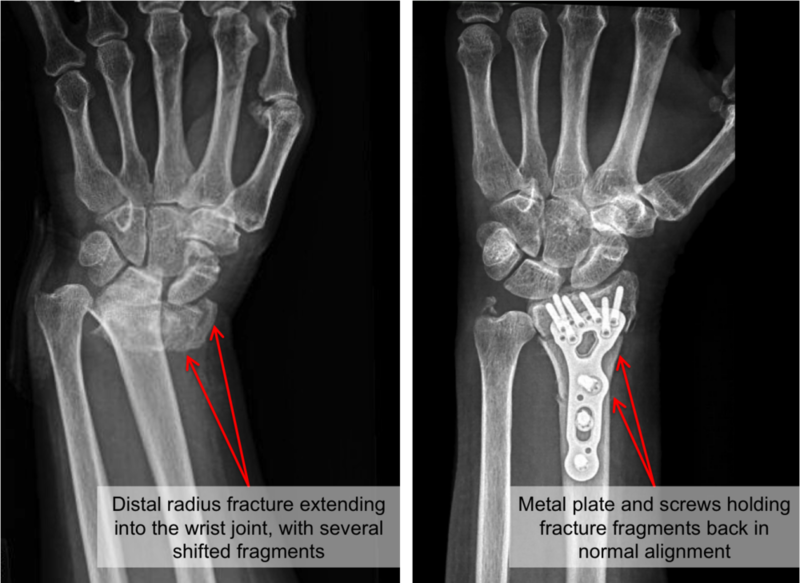 Some more severe fractures may require a small incision over the palm side of the wrist. The fragments of bone are lined up, and a metal plate and screws are used to hold things in place. The metal plate and screws allow people to start using the wrist earlier. Motion and light use of the wrist are started ~2 weeks after surgery. Once the bone has healed (~6 weeks), more vigorous activities are allowed. The metal plate and screws are made of titanium, they are usually left in place forever. They are very low profile, and not noticed by the patient (or airport metal detectors! ).